Learn to make Fresh pasta including Gnocchi, Ravioli, Penne and Farfalle plus Special Sauces! Your wine tasting features select regional favorites like Pugliese Rosso, Chianti Riserva and Nero d'Avola. Vivi bene! Click Here To See More Parties! Girls Night In Wine Tasting Party! 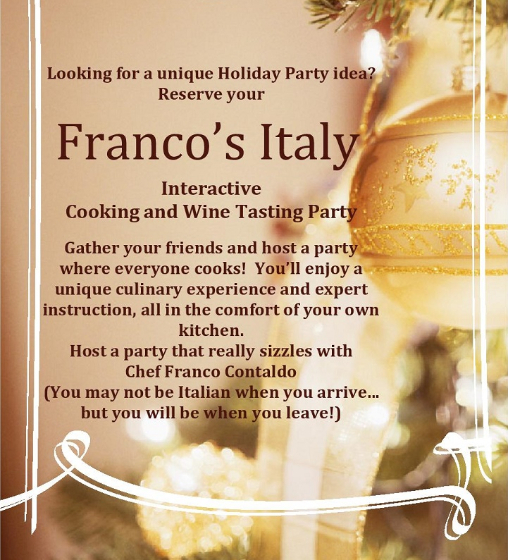 Reserve your Franco's Italy party now! Book a "Big Night" Party! "Big Night"? Then book your very own BIG NIGHT PARTY complete with many of the dishes, music and passion found in this fabulous classic film. Your party includes a Big Night DVD, a Louis Prima CD, Incredible dishes from the movie like Tri-Color Risotto, Tiramisu and of course...Timpano! Chef Franco teaches you how to create an Authentic BIG NIGHT Dinner! all this PLUS a fabulous wine tasting. Click on the movie poster below for more info!